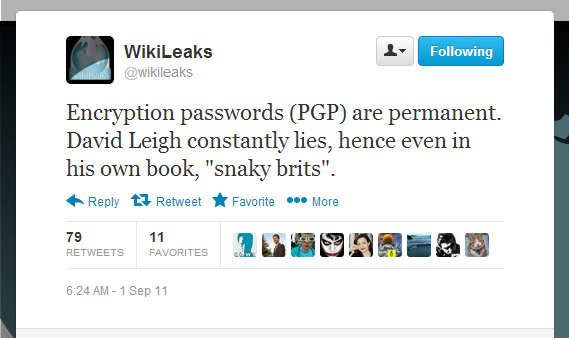 Joseph P. Farrell (WikiLeaks staff member) email to Jemima Khan regarding her 6th February New Statesman article: ‘Jemima Khan on Julian Assange: how the Wikileaks founder alienated his allies’. As you can imagine, when I read your article in the New Statesman I was very surprised. I was also shocked, but most of all, I was disappointed. When you told me in September 2011 that Alex Gibney, who had been commissioned by Universal to do a WikiLeaks documentary, had approached you to offer you an Executive Producer position on his film I attempted to ask you subtly why you thought he was offering you the position. My exact words were: “Being called an Executive Producer on one of Alex Gibney’s films is full of kudos and will certainly be very helpful in any further documentary projects. I am an inherent cynic (likely augmented by this work) but, if he is not asking for any production money, then it is purely a matter of branding and using your name as an endorsement.” Before approaching you, Gibney had already been trying desperately to get an interview with Julian for more than half a year, since February 2011, and had thus far been unsuccessful. I feared he might have been using you, not because he valued your opinions on the film, or because he was likely to ever ask you to produce anything else with him in the future, but because he needed access to Julian. In fact, just two months before the film premiered at Sundance you said to me that you were “getting my agent to insist I see the finished Gibney doc”. That, in itself, struck me as an executive producer with very limited executive power. Without access and without original interview footage, Gibney needed a tool to legitimise his film and add credibility to it. And, in the absence of the exclusive interview with Julian, what better way than to have the journalist celebrity who is publicly known to be a friend of Julian named in the credits? I am certain you were aware of that risk, because when you told me you were accepting the Executive Producer role you said: “I will still try to persuade Julian (via you) to cooperate (as I have done in the past) not because I’m now officially involved in the film – it’s not contingent upon any access to Julian – but because I genuinely think he needs friends not enemies now”. From the moment Gibney approached us we did extensive research into him. We looked deep and took advice from people who knew him and some who had worked with him. Every colleague, ally, friend and even the documentarians we spoke to advised us against an interview with Gibney. Yet we were open to talks, we were ready for dialogue, and we engaged with him and with Alexis Bloom, his producer. None of our meetings allayed our fears that their piece was not going to be the true story. They did not appear genuine to us and they seemed to have many prejudices about Julian and the organisation. Their angle favoured sensationalism from the beginning, an angle I would have thought you would oppose had you had any influence on the picture. Julian has had significant relationships with hundreds of people. Your list of so-called alienated and disaffected allies is not long: your article mentions nine people, one of whom Julian has never actually even met. You list Mark Stephens, an internationally little-known media lawyer who had a contractual dispute with Julian and who charged Julian more than half a million pounds for a magistrate’s court case defence. Yet you overlook Gareth Peirce, “the doyenne of British defence lawyers”; Michael Ratner, President Emeritus of the Center for Constitutional Rights and other lawyers at the CCR; Baltasar Garzon, the Spanish judge; Jennifer Robinson, who left Mark Stephens’ firm over the issue; Baroness Helena Kennedy QC; Geoffrey Robertson QC, the acclaimed human rights lawyer whose table you sit at regularly; John Jones; Julian Burnside SC and Julian’s other lawyers in Australia; his lawyers in Ecuador; the Icelandic lawyers; the Danish lawyers; the Washington lawyers; or any of the rest of an international team of dozens of lawyers who represent or advise Julian and WikiLeaks. You list Jamie Byng, who published an unprepared, unapproved, unfinished manuscript that had not been fact-checked without Julian’s knowledge, but you do not mention Colin Robinson or John Oakes of OR Books, with whom Julian has published a successful and acclaimed book without any problems or disagreements. Neither do you mention the more than fifteen other publishers who are releasing his Cypherpunks book in various languages, or indeed the publishers of Underground with whom he has maintained a good relationship for more than fifteen years. You list Daniel Domscheit-Berg, who sabotaged WikiLeaks’ anonymous online submission system, first stole and then deleted more than 3,000 submissions evidencing, inter alia, war crimes, corruption and bank fraud. He also started a rival organisation, OpenLeaks, a still-born branding exercise with zero publications. His entire livelihood is earned by constantly backstabbing the man who fired him. You list a person, who you incorrectly describe as “the technical whizz behind much of the WikiLeaks platform”, who was in actual fact a technician contracted to upgrade our submission platform according to Julian’s architectural design specifications. He was first referred to in Domscheit-Berg’s book as “the architect”, a propaganda term invented by Domscheit-Berg for his book well after he was suspended from WikiLeaks. The term is clearly designed as an attempt to steal Julian’s creative authority. But you are correct that this is the way that he is portrayed in Daniel Domscheit-Berg’s book, which contains numerous falsehoods. I am, as I have always been, at your disposal to clarify those stories that are promoted in an attempt to harm WikiLeaks and Julian and to give you the true facts. Had I known you had an interest in the architectural make-up of the submissions platform and its coding genesis, I could have explained this to you further in person. You list the Guardian and the New York Times, the two organisations who broke their agreements with us. 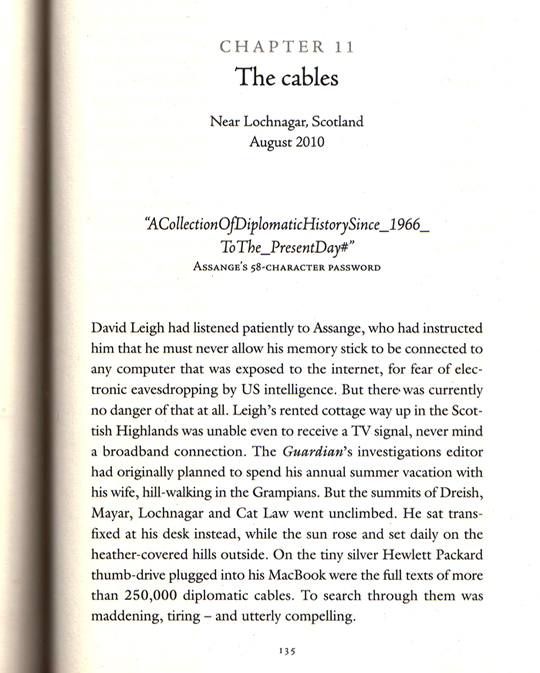 One of the contractual clauses that the Guardian broke was to disclose a password that unlocked a list to all the diplomatic cables, which it published in its book in an act of gross negligence. Both the Guardian and the New York Times have written factually incorrect books about us to whitewash their deceitful actions, which they continue to profit from and promote. You don’t, however, mention the 110 media partners with whom we have ongoing working relationships, some of whom have also written books about WikiLeaks but who donate all the profits to us, as a gesture and in solidarity to help us circumvent a banking blockade that has eroded the majority of our resources. Why don’t you list the hundreds of activists, researchers and publishers who play a day-to-day role in WikiLeaks’ operations – the technicians who maintain servers; the developers, mathematicians and cryptographers who build new search interfaces and oversee the internal security protocol; those who curate data for us; the investigators who corroborate submitted material; or the managers and administrators who plan and bring projects to fruition? Why don’t you list the allies and friends across the world who enjoy a close personal relationship with Julian and who are part of the same support community that you once were – the more than 150 people you spent time with at Julian’s private 40th birthday party, to which Julian was generous enough to invite even Alex Gibney? Is it because they do not seek acclaim in the press and because they do not say negative things about Julian, and hence have zero currency in the news? As to falling out with Alex Gibney, Julian never fell out with him – Gibney was never a friend in the first place so there was never any relationship to fall apart. Alex Gibney was just another one in a long list of people trying to cash in on Julian and WikiLeaks. You may remember me saying how utterly offensive I find it that there are all these people out there who are benefiting financially from Julian, while the organisation suffers a banking blockade and lawyers have eaten away all of his personal funds. You asked me for a response to David Allen Green’s article on 20th August 2012 and I told you that it was being produced. I told you that your request for this response did not go directly to Julian as you thought it had, but instead that it came to me. My email to you after we met said: “I will get you a response to the DAG article and, as I said, blame me, not him, for the lack of response.” What you asked for was not as simple as you thought, which was that Julian could probably rattle off the legal sections and sub-sections by heart – the response was far more complicated than that. I have attached it. It is 55,972 words long, which is roughly 70 per cent of the length of a doctoral thesis. 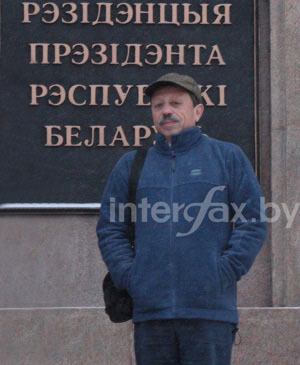 Julian’s legal defence committee prioritised this and asked a person to look into the arguments in depth, in order to produce a compelling response due to the harm caused by David Allen Green’s misinformation. It was peer-reviewed and revised and took six months to produce for you – a time resource that does not come cheap to a defence committee that has to deal with simultaneous challenges, David Allen Green being just one. Something of this length and detail ought to have taken three years to produce. I did not merely tell you that Julian was “very busy”. You know that. What I did say was that he was very busy and that we were a very small core team. Your email asking for a response to the David Allen Green piece was written the day after Julian made his first speech in public since he had entered the embassy, four days after he formally obtained asylum and only five days after the embassy was surrounded by more than 50 Metropolitan police who were preparing to force their way into the diplomatic mission to get him. On top of this, we were still publishing the Syria Files and we had just begun a new release, the Detainee Policies. I told you that since the establishment of the Guantanamo Bay prison facility none of the world’s media and none of the world’s NGOs had released a single Guantanamo Bay Manual, and we had just released our third. During all of this, we were also dealing with the vitriol coming from the UK establishment media while Julian was having his asylum claim evidence reviewed. He was (and still is) in fear of being extradited onwards to the United States, he had not been outside in more than two months, and he was overseeing the publication of hundreds of thousands of documents. Over a lunch you questioned this fear of extradition to the US, and when I asked you what you would do in his position you refused to answer the question. I asked you more than six times what you would do in his shoes. Having offered to cooperate with the Swedish investigation non-stop for the past two years and been refused with no proper explanation, and believing that you would end up in an American prison for decades, in solitary confinement and under SAMs, what would you do? You never gave me a concrete answer. Instead, you skirted the question with another question and discounted the numerous legal opinions out there, favouring instead an article by David Allen Green. I reiterated that Julian had never said that it would be likely in practice that he would face the death penalty, although the Espionage Act permits this. But more to the point, and one that everyone always ignores, there was (and still is) the fear of being extradited to face life imprisonment and almost certainly torture or other inhumane and degrading treatment for his publishing activities. I told you that the Swedish authorities could, if they wanted to, charge Julian in absentia. Even if they were to do that, they should, according to their own procedures, conduct an interview with him before requesting his extradition. I repeated that he remains available even in the embassy for questioning by the Swedish authorities should they wish to employ the standard procedures they use regularly in other cases. I explained to you how the argument that “he is no more vulnerable to extradition to the US from Sweden than he is from the UK” is a red herring. I explained why the US had not already requested his extradition from the UK, because this would create a case of competing extradition requests that the Home Secretary would have to judicially review and prioritise one over the other, thereby creating political embarrassment for a major ally whichever way the decision went. I cited the US Ambassador’s own admission that the US would wait to see what happened with the Swedish case before they made a move. I was careful to explain this with Jennifer Robinson present to add a legal perspective if needed. However, in spite of this explanation, you allowed this claim not only to go into your article but also to remain in Gibney’s film – expressed in remarks made by Baroness Helena Kennedy QC that have been misleadingly edited to remove their proper context. She has since said that she “did not expect that he [Gibney] would fillet my interview” and also says “I regret thinking I could present a sensible perspective”. Irrespective of my explanations and those of two lawyers whose counsel you seek yourself, you could have spoken to Julian in person. He did call you – more than once. You could have called back. You could have come to visit him to check on his well-being, as many others have done. On that note, you were never invited just for a “photo opportunity”. You were invited to the embassy by us in September but you heard that there was a paparazzi waiting outside the embassy. This is no great surprise following the biggest diplomatic incident in recent years. However, you knew about it beforehand and avoided it. Then I relayed a request from Vivienne Westwood’s team, asking you if you would model her “I am Julian Assange” t-shirt at her fashion show. The request came after you had already said you were unavailable even to attend her show. This was her idea and her request. She was trying to do something to help us and thought you would want to do the same. You were also invited to visit Julian shortly after he entered the embassy on 22nd June; for tea and cake on his birthday on 3rd July; for a sureties’ get-together in late July; for afternoon tea on 11th September and again on the 9th October; and for a breakfast meeting on the 21st December. All of which you declined. These are all times when you could have asked Julian in person about your issues. As you will recall from your discussion the last time you saw him, in December 2011, he enjoys debate and disagreement. How do you know that Julian had not seen the Gibney film by the time it premiered? We do not steal secrets but people leak things to us. Irrespective of the “ironic” meaning behind the title of the film you claim it has, it will not be understood by the general public with that meaning. What they will see is a straightforward conjunction of a quote, a proper noun and the word “story”, and they will read it as such. It is tantamount to someone doing a documentary about you and calling it “I am a War Apologist: The Jemima Khan Story” because they had interviewed someone completely unrelated to you and quoted them saying “I am a war apologist”. It is one thing to publicly disagree with someone, or even to distance oneself in public from a former ally, but it is quite another to use one’s own publication to the further harm of a political refugee suffering the persecution of a superpower. I imagine you must have vetted the magazine cover, which claims that Julian is ‘alone’. Julian is not alone. That New Statesman front page was used to harm the entire WikiLeaks project out of disaffection. It was also an attempt to cast a shadow on all his allies. And yet you were the one who said: “he needs friends not enemies..”. Julian has both friends and enemies. He does not need or seek friends who only agree with him (in fact, I have not met one non-argumentative friend of his) but he certainly does not need friends who are in fact enemies. 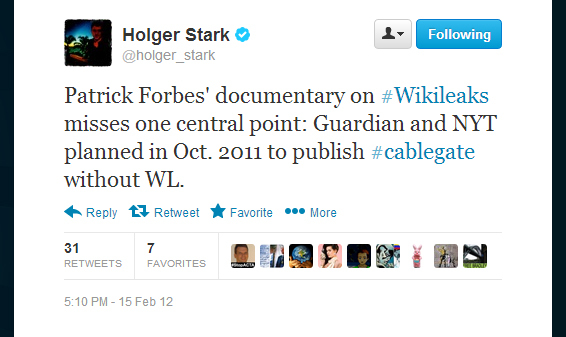 From the point of view of defending a film in which you feature as “Executive Producer”, your actions are straightforward: your name is on the credits of a dated WikiLeaks documentary with a prejudicial title which features all the hostile people who haven’t had anything to do with WikiLeaks in years. You chose a production credit over principle and in doing so attacked a vulnerable political activist and fellow journalist, something which I know to be beneath you. Jemima Khan’s New Statesman article can be found here and John Pilger’s response to it is here. Alex Gibney’s response to John Pilger’s article can be found here, WikiLeaks response to it can be found in the article’s comments section and there is a correction of the facts of the article by John Pilger at the bottom. This entry was posted in Uncategorized and tagged Alex Gibney, Daniel Domscheit-Berg, David Allen Green, Gibney, Jemima Khan, Joseph Farrell, Julian Assange, New Statesman, WikiLeaks on March 7, 2013 by marthamitchelleffect. “Morrow [US govt prosecutor] went over some of the portions in the statement that the government specifically objects to being read in court. One of them talks about “staying in contact” with Nathaniel and how Manning thought he was “developing a friendship”. They would talk about not only the publications WikiLeaks was working (on). He later realized he valued the friendship himself more than Nathaniel. (‘Nathaniel Frank’, the name on the account the government has claimed was being used by WikiLeaks editor-in-chief Julian Assange, though no actual proof of him sending messages to Manning has been presented). The U.S. government’s objection to a section of Bradley Manning’s statement (which describes his contact with ‘Nathaniel Frank’) being read out in the courtroom and their refusal to explain why they objected, indicates that it might severely damage the U.S. government’s Grand Jury case against Julian Assange and WikiLeaks. In the end, despite the objections, Manning was permitted to read out the ‘Nathaniel Frank’ section. It appears that Manning understood ‘Nathaniel Frank’ to be a senior member of WikiLeaks codenamed ‘Ox’ and that Manning later came to believe that ‘Ox’ was either Julian Assange or Daniel Domscheit-Berg. Manning says that he encouraged ‘Ox’ to use the handle ‘Nathaniel Frank,’ who, in real life, is a U.S. Army veteran campaigner for Don’t Ask Don’t Tell and author of “Unfriendly Fire: How the Gay Ban Undermines the Military and Weakens America”. On the 19th December 2011 (day four of the pre-trial hearing), prosecutors disclosed three excerpts of alleged Bradley Manning (who was using the name ‘nobody’) and ‘Nathaniel Frank’ chat logs. They had been taken from 14 to 15 pages of chats (.XML format), which had been recovered from an unallocated space on the hard drive of Bradley Manning’s Macintosh laptop by Mark Johnson, a digital forensics contractor for ManTech International who works for the Army’s Computer Crime Investigative Unit. Mark Johnson was able to decrypt the chat logs when it was discovered that Manning’s laptop login password ‘TWink1492! !’ was also used as the encryption key. (8:03:42 AM) info@adrianlamo.com: I cornered Ashcroft IRL, in the end. Bradley Manning’s buddy list also contained a second handle, ‘pressassociation@jabber.ccc.de,’ which had two names attached to it: Julian Assange and ‘Nathaniel Frank’. In testimony, Mark Johnson thought that it was odd to assign two names to a single Jabber account, and implied that there was something significantly untoward in such an anomaly. During the night shift at SCIF (Joint Operations Center/Secure Compartment Information Facility) in Iraq, Bradley Manning allegedly burned a CD containing the JTF-GITMO documents (classified assessment reports about Guantanamo Bay detainees) which he then uploaded to WikiLeaks. The chat logs between ‘nobody’ and ‘Nathaniel Frank’ (8th March 2010) contain a request to re-send some unspecified data as well as the use of SFTP for uploading data securely to an FTP server. Mark Johnson believes this means that the parties had communicated before. Mark Johnson also testified that SSH logs show this FTP server has an IP address (88.80.17.761) associated with a Swedish ISP called PRQ which he believes is, in turn, associated with WikiLeaks. In another chat log (which has not been fully reproduced by any media outlet that has cited it), ‘nobody’ asks ‘Nathaniel Frank’ to help him crack the password on his SIPRnet computer and states that this involves IM NT hashes (there is no such thing as IM NT hashes, but it is possible that this is a typo for NTLM – Microsoft NT LAN Manager). This is supposedly so that he can log on to the system without leaving any traces of his activity. ‘Nathaniel Frank’ replies that “yes” he has experience of such things and that they use “rainbow tables” to open hashes. Mark Johnson then stated that “nobody” then sent ‘Nathaniel Frank’ something that appeared to be a hash and tellingly does not mention anything being sent back. With regard to: Specification 1, Charge III – government attorney Capt. Ashden Fein stated that the State Department server had logged 794,000 connections from Bradley Manning’s SCIF computer, which recorded “minute-to-minute” the transfer of 250,000 cables (which allegedly took “all of his working hours over 10 days” to download) as well as Bradley Manning’s searches of the Pentagon’s SIPRNet (it is alleged that data-mining software “unauthorized software” [Wget] was used on two occasions) and that there was direct evidence of Bradley Manning uploading the documents to WikiLeaks. Simple deduction shows that ‘Nathaniel Frank’ (no evidence has been submitted showing that this is in fact Julian Assange or anyone else associated with WikiLeaks) did not assist Bradley Manning’s alleged attempts to bypass the SIPRNet security system because Bradley Manning never made any attempt to do this or to hide his activities. In the 35-page personal statement read out to the court on the 28th Febuary, Bradley Manning stated “I never hid the fact that I downloaded copies of CIDNE-I (Iraq War Logs) and CIDNE-A (Afghan War Diary) and burned them onto CDs”. Manning said that he did this as a normal “part of his work,” making back-ups for when the system crashed and for faster searching. He stored the CDs “in the open” at his unit’s tactical operations center and did not hide his use of downloaded compression software to help facilitate the transfer. 2:15:57 PM) bradass87: they also caught wind that he (Julian Assange) had a video.. of the Gharani airstrike in Afghanistan (which killed nearly 100 civilians, most of them children – this file was later deleted by Daniel Domscheit-Berg to the immense relief of the Pentagon), which he has, but hasn’t decrypted yet.. the production team was actually working on the Baghdad strike though, which was never really encrypted. The conversation between ‘Nathaniel Frank’ and Bradley Manning that seems to fit Specification 1, Charge III – most likely relates to decrypting data already transferred to WikiLeaks. 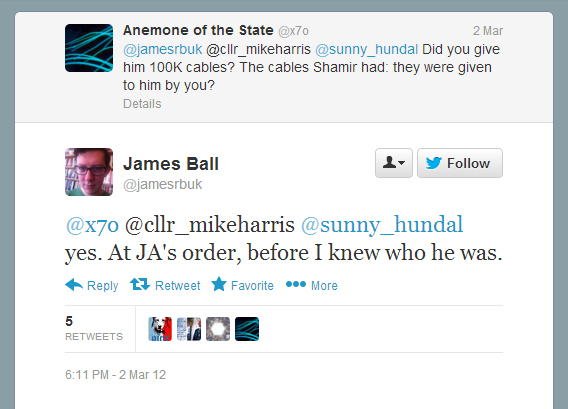 By the time this conversation took place (8th of March 2010), Bradley Manning had already accessed and leaked material from SIPRNet numerous times. U.S. prosecutors say that the Gharani airstrike video (BE22 PAX.wmv) was leaked first, most likely occurring by 8th January 2010, and so to attempt to hide future activity was by then absurd. Bradley Manning’s access level was not unusual; 4.2 million U.S. military, federal employees, contractors, and consultants have security clearances for SIPRNet which had been ‘opened up’ post 9/11 to enable sharing across the so-called ‘intelligence community’ – there was no need for him to hack into it. The U.S. government’s second-highest level of classified information, “Secret”, is held on SIPRNet, “Top Secret” information is shared via the Joint Worldwide Intelligence Communications System (JWICS). Bradley Manning would have had to hack into JWICS to access its data, but he did not. According to Bradley Manning’s plea statement, he interpreted his relationship with ‘Nathaniel Frank’ as being one of “friendship”. However, this was an entirely subjective perspective on the part of Manning, the initial circumspect nature of ‘Nathaniel Frank’s interaction with Manning indicates the professional approach of a journalist dealing with an anonymous source. Later the communication was mostly one way, with ‘Nathaniel Frank’ replying in a polite and sympathetic manner. In Bradley Manning’s statement he tells his story about ‘Nathaniel Frank’, saying that while he “enjoyed the ability to discuss pretty much anything, in retrospect, I realize these dynamics were artificial. They were valued more to me than Nathaniel”. Bradley Manning also stated “No one associated with the WLO [WikiLeaks Organization] pressured me to give them more information. The decision to give documents to WikiLeaks [was] mine alone”. Manning said he took “full responsibility” and that he wanted the information to become public “to make the world a better place”. The UN special rapporteur on torture Juan Mendez, formally accused the U.S. government of cruel, inhuman and degrading treatment towards Bradley Manning after a 14-month investigation. The most likely reasoning behind this treatment was to coerce Bradely Manning into providing the U.S. government with evidence against WikiLeaks. This appalling tactic failed. It now appears that his interactions with WikiLeaks can provide little of interest to those pursuing Julian Assange and WikiLeaks. Further, Bradely Manning is not the type of character who would provide false evidence to the U.S. government out of self-interest or from being mentally and emotionally broken. Until the ‘Nathaniel Frank’ chat logs are fully disclosed, forensically tested and verified by independent experts, we will not know for certain the truth of the U.S. government’s case against Julian Assange. This evidence will almost certainly be disclosed and tested during Bradley Manning’s full court-martial, which is due to begin in June 2013. Charges of “conspiracy to commit espionage” and “soliciting or encouraging” Bradley Manning to commit crimes will either fall apart or persist around the ‘Nathaniel Frank’ logs. The grand jury investigation of WikiLeaks began on the 29th November 2010, when U.S. Attorney-General Eric Holder stated that the Justice Department was pursuing “an active, ongoing criminal investigation” into WikiLeaks. More than 250,000 U.S. State Department cables had been released by WikiLeaks the day before. That as part of this investigation, eight FBI agents arrived unannounced on a private jet in Iceland on the 24th August 2011 to interview a WikiLeaks associate (who sold t-shirts to raise funds for the organization), only to be told by Interior Minister Ögmundur Jónasson to “pack their bags, embark the plane and leave the country”, shows a certain desperation. Ögmundur Jónasson also stated in the Alþingi (the Icelandic parliament), that the FBI had intended to use the teenager they questioned, Sigurður Þórðarson (aka Siggi ‘the hacker’), as bait in their investigation of WikiLeaks. Þórðarson has stated that, despite five days of ‘questioning’, he refused to work for the FBI. The Icelandic Commissioner of the National Police and the Icelandic State Prosecutor are currently investigating violations against the Icelandic state by the FBI. Such antics suggest that the ‘Nathaniel Frank’ logs and other forensic evidence amount only to evidence of serious journalism. This entry was posted in Uncategorized and tagged Bradley Manning, Daniel Domscheit-Berg, Espionage Act, Fort Meade, Julian Assange, Manning, Nathaniel Frank, Quantico, US Army, Wikileak on February 28, 2013 by marthamitchelleffect. On the 23rd January 2013 the Sam Adams Associates for Integrity in Intelligence presented this year’s award to Dr Tom Fingar at a ceremony co-hosted with the Oxford Union Society. Julian Assange gave an address live via Videolink and then engaged with the audience in a question-and-answer session. The next day The Guardian attacks Julian Assange: Julian Assange finds no allies and tough queries in Oxford University talk, 24th January 2013, by Amelia Hill. The article refers to a Guardian writer Simone Webb “Waving her anti-Assange banner while around 400 undergraduates queued to get into the hall, Simone Webb, the protest organiser, insisted the demonstration was not a stand against free speech.” In an article of 611 words, 74 are spent describing the event, the rest is an attack, of which 154 are given to anti-Assange banner waving Simone Webb and 91 are given to someone called Savage who “was left sanguine” by Julian Assange’s polite answer to her question. This distorted article is comprehensively dissected and dismantled by M Cetera here. The article was so disgraceful that the Sam Adams Associates responded to it in ‘a letter to the Guardian‘. With regard to the 24 January article in The Guardian entitled “Julian Assange Finds No Allies and Tough Queries in Oxford University Talk,” we question whether the newspaper’s reporter was actually present at the event, since the account contains so many false and misleading statements. If The Guardian could “find no allies” of Mr. Julian Assange (Report, 24 January), it did not look very hard! They could be found among the appreciative audience of the packed Oxford Union Debate Hall, and – in case you missed us – in the group seated right at the front of the Hall: the Sam Adams Associates for Integrity in Intelligence. Many in our group — which, you might be interested to know co-sponsored the event with Oxford Union — had traveled considerable distances at our own expense to confer the 10th annual Sam Adams award to Dr. Thomas Fingar for his work on overseeing the 2007 National Intelligence Estimate that revealed the lack of an Iranian nuclear weaponization program since 2003. But However, none of this, nor any aspect of Dr. Fingar’s acceptance speech, made it into what was supposed to pass for a news your article; neither did any aspect of the acceptance speech delivered by Dr. Fingar. Also, why did The Guardian fail to provide even one salient quote from Mr Assange’s substantial twenty-minute address? If the Guardian could “find no allies” of Julian Assange (Report, 24 January), it did not look very hard. They could be found among the appreciative audience at the Oxford Union, and in our group seated at the front: the Sam Adams Associates for Integrity in Intelligence. Many in our group, which co-sponsored the event, had travelled considerable distances to confer the 10th annual Sam Adams award on Dr Thomas Fingar for his work overseeing the 2007 National Intelligence Estimate that revealed the absence of an Iranian nuclear weaponisation programme since 2003. Many of us spoke about the need for integrity in intelligence, describing the ethical dilemma that confronts government employees who witness illegal activity, including serious threats to public safety. However, none of this, nor any aspect of Dr Fingar’s acceptance speech, made it into your article. If the Guardian could “find no allies” of Mr. Assange, it did not look very hard! They could be found among the appreciative audience of the packed Oxford Union Debate Hall, and – in case you missed us – in the group seated right at the front of the Hall: the Sam Adams Associates for Integrity in Intelligence. Many in our group – which, you might be interested to know co-sponsored the event with Oxford Union – had traveled considerable distances at our own expense to confer the 10th annual Sam Adams award to Dr. Thomas Fingar for his work on overseeing the 2007 National Intelligence Estimate that revealed the lack of an Iranian nuclear weaponization program. But none of this made it into what was supposed to pass for a news article; neither did any aspect of the acceptance speech delivered by Dr. Fingar. Also, why did the Guardian fail to provide even one salient quote from Mr Assange’s substantial twenty-minute address? This entry was posted in Uncategorized and tagged Amelia Hill, Guardian, Julian Assange, Oxford Union, Ray McGovern, Simone Webb, Thomas Fingar, United States on January 29, 2013 by marthamitchelleffect.